Sitting between Guatemala and Nicaragua in Central America, Honduras is a beautiful country with amazing crystal clear waters, 669km of Caribbean coastline and the Mesoamerican Great Barrier reef to adventure into. This is all for a margin of the price compared to the rest of Central America, let alone the rest of the world when it comes to diving. 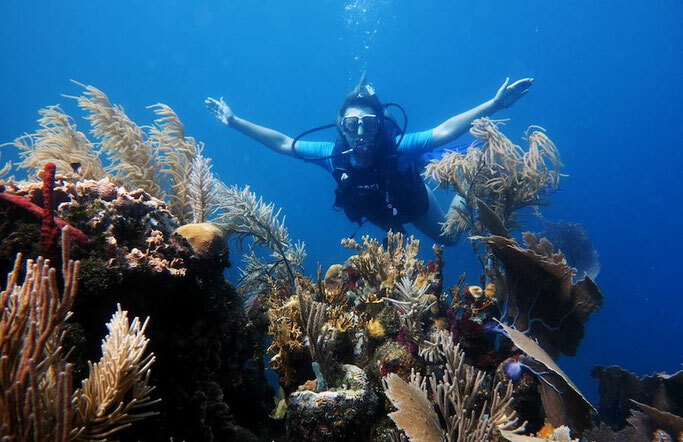 Honduras has surprised and will continue to surprise tourists for years to come with what its waters has to offer to the diver, so let's dive in! There are three main dives areas in Honduras, Utila, Roatan and Guanaja. Most however head to either Roatan or Utila for the best of the diving. While they are very similar in diving, they are worlds apart as a holiday destination. Roatan is more developed, with American tourists, honeymoon couples and the cruise ship twice, weekly. As a result of this development and attraction to couples, the price tag is far higher compared to its sister island of Utila just a few miles apart. Utila opposingly attracts the budget traveller and a younger demographic. The shorefront is lined with dive centres, food stalls and bars that are alive until the early hours. While both have similar dive spots, my vote is with Utila. As a solo female traveller endearingly put it ‘I saw all the fish I did in Utila but ended up feeling the most single and alone I ever have!’ when in Roatan. Here is my guide to the two islands. As mentioned previously this island, like moths to a flame, attracts the budget traveller wanting lots of everything; dives, bars and other travellers to join in on the fun. Utila is the closest to the mainland and is also the smallest island, being under 10miles long. You can get here by plane but the majority will be heading here by ferry from La Cieba on the mainland. Once on the island there are tuktuks or ‘taxis’ but with the size of the island, walking everywhere is very easily done. Utila is known as the cheapest and one of the best dive sites in the Caribbean along with bring loads of other great advantages to heading here. Having nowspent time on the island I can recommend Underwater Vision as a great dive centre to dive with - founder of Girls that Scuba also did her Advanced Open water here years before GTS started! Handled in a professional manner, good equipment, free accommodation in the PADI qualification package all at a good price. It was a dive centre recommended to me by other travellers and on walking down the entire strip taking a look just in case there was something better, it seemed even people not diving with them headed here. It is also the only dive centre on the island with a decent beachfront, deckchairs, hammocks, volleyball net etc.